Bethlehem has always been the focus of outrage. In their early years they were involved in a string of anti-metal censorship from parents' groups due to suspicion of inciting Satanism, while in later years, A Sacrificial Offering to the Kingdom of Heaven in a Cracked Dog's Ear, an underwhelming remake of one of their previous successes, outraged fans, to the point that many foresaw the end of the band. Well, they're still here, but it's hard to say if listeners will enjoy their latest album, Hexakosioihexekontahexaphobia. Even setting aside the potential conservatism of fans and taking the album on its own merits, this is a decidedly mixed bag, much more like gothic rock than anything they've previously done, though more listenable than their music of the recent past. Kettenwolf greint 13-11-18 starts the album off with a gothic vibe to the mid-tempo track. The distortion kept fairly light, there's a rock beat, and Guido Meyer de Voltaire provides deep but clean vocals. This is not a particularly aggressive track, though it has a reasonably good solo, nor is Egon Erwin's Mongo Mumu, its successor, which sounds very similar -- I couldn't help thinking of these two as "Rammstein Lite". Verbracht in Plastiknacht, however, has more promise; the vocals are darker and grittier, as the guitar wails in the background to industrial drums and nameless scrapings, and the minimalist guitar is more effective for de Voltaire's clean vocals on Gebor'n um zu versagen than on the earlier tracks. Spontaner Freitod brings back some much-needed heaviness, which drifts off into more vaguely thoughtful instrumentals to finish at a doomy pace, and Warum wurdest du bloß solch ein Schwein? is also doomy, featuring harmonized lead guitars to go with de Voltaire's growled vocals against a violin backdrop. This is one of the few songs on here that I found really had a strong point songwriting-wise to it. Ich aß gern' Federn is another surprise. Emotional and soft, it reminded me of some of Devin Townsend's quieter pieces. It's nice, but I had a hard time staying awake to it. 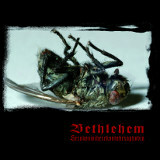 Bethlehem doesn't seem to be at their best when they focus on the lighter side, and as a result, the industrial grinding of Kinski's Cordycepsgemach, which is equal parts gritty synth, heavy doom riffs, and clean-guitar meandering, was more to my taste. Antlitz eines Teilzeitfreaks, despite its distorted vocals, sounds like a rock song with strong pop influences mixed in with all the wailing lead guitar, tremolo picking, and deep-voiced choruses. Hexakosioihexekontahexaphobia is better than expected, but one can't help comparing it to a past masterpiece like Dark Metal and finding it lacking. This German gothic rock of theirs is not terrible stuff, but it's not great, either; the mild-mannered beats and mostly aimless melodies make it a hard thing to love. Despite its echoes of past greatness in some of the songs, listeners will search in vain for a return to Bethlehem's original, genre-defining sound, and one has to be very willing to give them the benefit of the doubt to appreciate this.